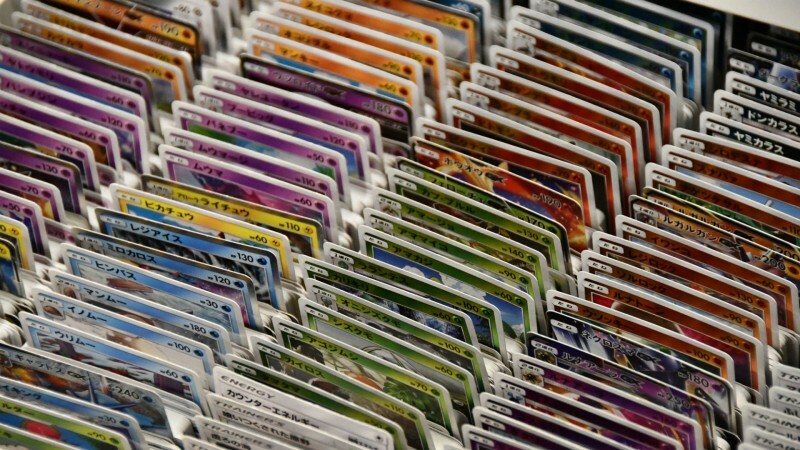 Since 1996, the Pokémon Trading Card Game (TCG) has exceeded all expectations. It rode the fever pitch of the Pokémon craze that swept the world in the late ’90s, selling millions of packs around the world. Parents feared their children would lose themselves (and their own money) to the game, retailers were constantly selling out their stock, and schools banned the cards from their classrooms. But the card game, much like Pokémon itself, has proved more than a passing fad. As of March, nearly 24 billion cards have been sold worldwide in over 11 languages across 74 countries and regions. This year’s Pokémon World Championships offers over $500,000 in prizes. With 80 sets released in the United States and more releasing at a steady clip, it’s clear the TCG holds a large claim to the Pokémon pie, and shows no signs of slowing down. 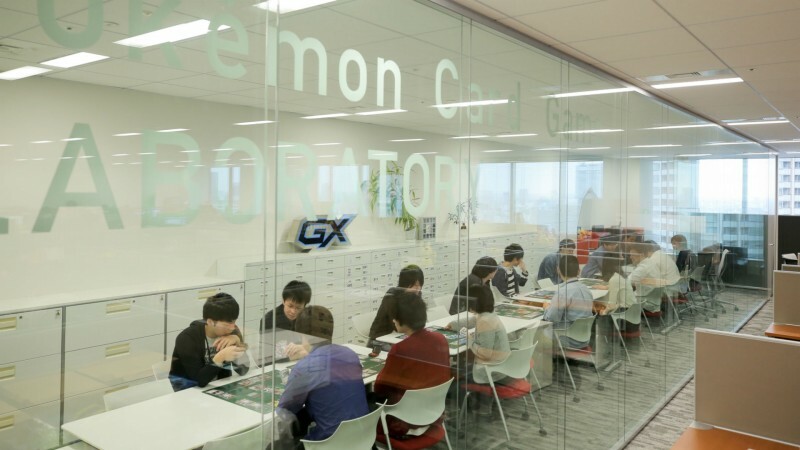 To see how these extremely popular cards are made, The Pokémon Company recently offered us a rare look at how Creatures, the studio in charge of maintaining the TCG, designs, draws, tests, and releases new additions to one of the world’s most popular card games. Although the logo in its lobby is a clean, white-on-black printing of its name, visitors immediately know they’re entering Pokémonland when setting foot in Creatures. They’re greeted by a chest-high figure of an Alolan Exeggutor alongside plushies of various pocket monsters and other Pokébelia lining its various nooks and chairs. 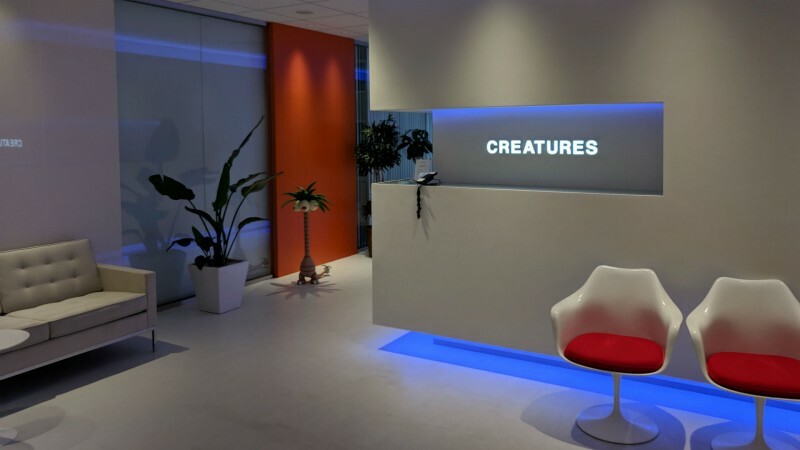 Although the studio was originally formed as Ape (the developer behind Earthbound), Creatures is clearly fully dedicated to the franchise it’s helping to cultivate. 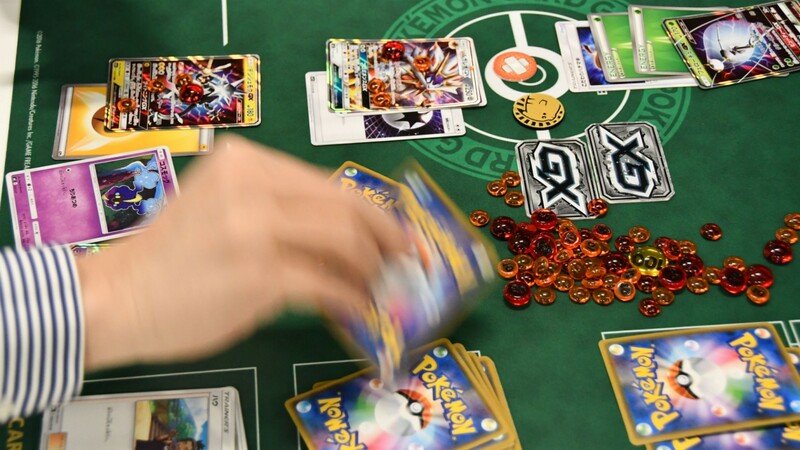 Like many card games, the Pokémon TCG is tied to a larger media empire. As such, making sure it has synergy with the rest of the Pokémon brand is a top priority for Creatures. 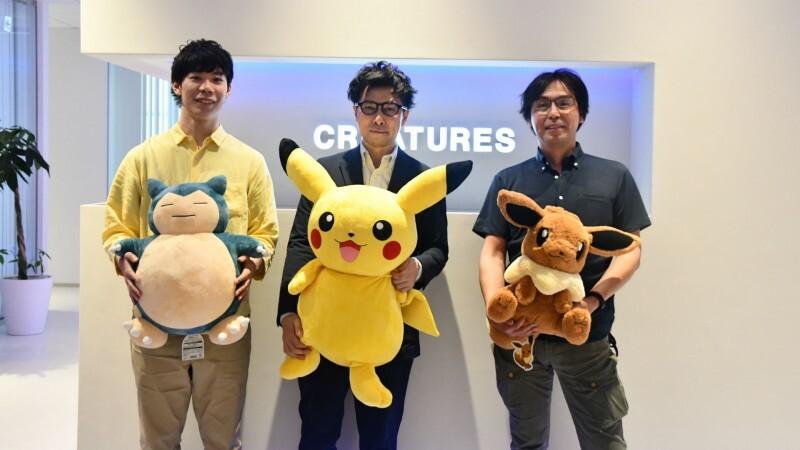 “The Pokémon that were really featured heavily in the [latest] video game, or had a big role in the story, we’ll make sure they’re at the center of whatever the set we’re making is,” says the TCG’s game director Atsushi Nagashima. Despite the attachment to an established franchise, Nagashima and his crew of designers have quite a bit of freedom. 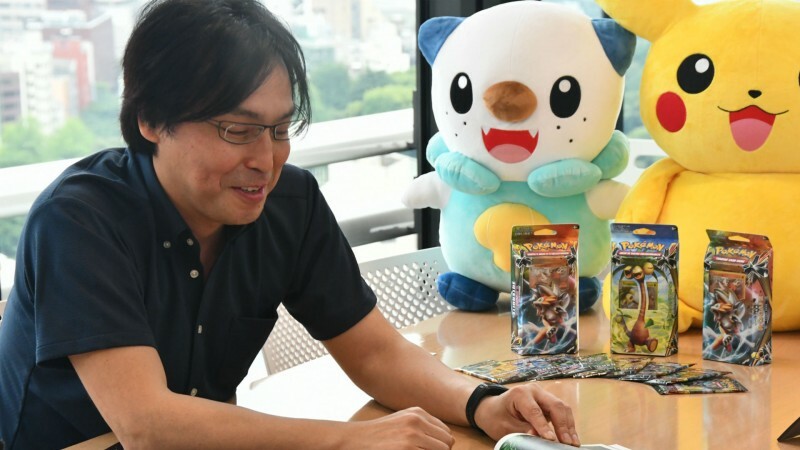 After deciding on the overall theme of a new set based on what’s going on in the world of Pokémon, Nagashima and his team begin outlining the “logic” (the abilities and effects) of the set. They then work with artists on the look of the cards, as well as individual art pieces based on the characters and mechanics they’re emphasizing. All in all, it takes about one year for a full set of cards to go from conception to release. The design team will often create a card with specific attributes, then find Pokémon who best fit those stats. While it may not seem like an important part of designing a card game, Creatures does spend time crafting the “story” of each set, but because cards can only convey so much information through images and single lines of flavor text, it’s not at the forefront. One recent set, Breakthrough, involved the story of two parallel worlds split apart by time, each with its own Mewtwo. “There was a Mewtwo that was in this advanced world, this really advanced civilization, and there was a Mewtwo that was in this more old-fashioned or old-timey world,” Nagashima says. “And these two worlds collide and the world goes into chaos and is destroyed as a result of that.” Despite the minimalist nature of the “storytelling” in each set, players do occasionally discuss potential storylines of certain cards when they launch. Creatures knows Pokémon must, at some level, be something any child can learn quickly, so it’s opted to bump up the numbers instead of introducing too many new ideas. Starting around the time of the Black and White era (around 2010), the company began making a conscious effort to find ways to make it harder for new players to be trounced by veterans. “We designed the cards in a way that, even if a kid is playing up against someone much older, it will still be a game where they can at least feel like they’re fighting on an even playing field,” Nagashima says. For instance, many Pokémon abilities deal more damage per successful coin flips, and cards like Pokémon Catcher can swap an opponent’s active Pokémon out for a weaker one instantly. These abilities may not make the game more “balanced,” but tend to make matches more exciting for newer players who might otherwise get trounced by pure skill. 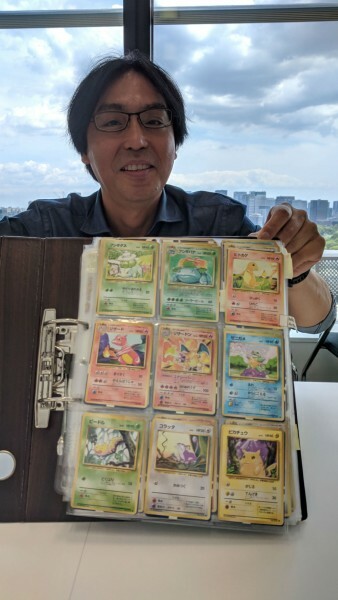 Mitsuhiro Arita was drawing Pokémon long before they had taken over the world, and meeting him is the next stop on our tour. Working as a freelance illustrator when the card game was in its prototype stage, Arita is responsible for some of the most recognizable playing cards in the world. The original holographic Charizard, bending its neck downward to breathe fire amidst a slew of red-orange mist and action lines, is Arita’s work. The original portlier Pikachu card, with its ears, tail, and back tinted purple from the light behind it? That’s him too. Arita keeps a binder full of all the cards he’s drawn over the years (the company sends him every card he’s illustrated), and it’s a pretty thick binder, holding 537 cards. 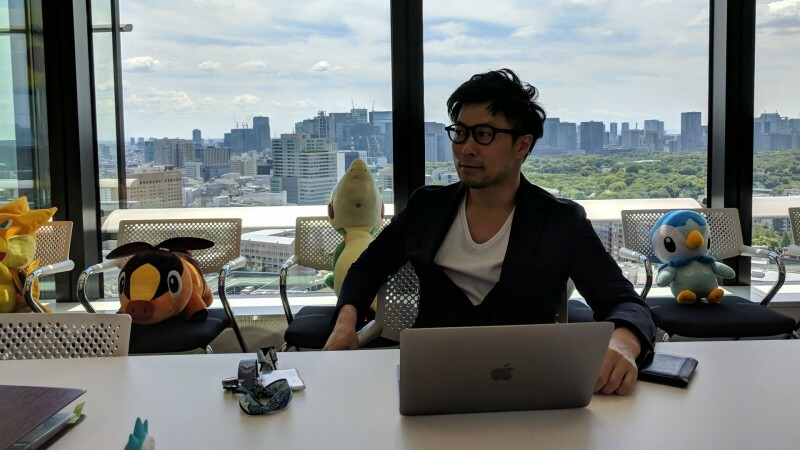 Although he’s still a freelancer, The Pokémon Company remains his biggest client, and drawing cards for the TCG has been a major part of his career. When Arita was first drawing cards, the process was much more difficult than it is now. The original games, Red and Blue, had only green-and-black mock-ups and concept art to work with. “When I first started working on the project, pretty much that’s all I had as reference, were those sprites with the pixel art of the Pokémon,” Arita says. Arita had very little idea of what he was drawing, either; this was before the games had launched. Even after the games were out, it took them about a year to become the massive hits they are today. Had he known what kind of impact the monsters he was drawing then would have on the world, he might have charged a little more for his services, he jokingly tells us. With modern computers, scale is no issue technically, but Arita still keeps it in mind. “One of the things you see with the card game, when you have a really detailed scene and you shrink it down into this card, it actually has less of an overall impact, it’s less imposing, so you really have to be careful with that balance,” he says. After our interview, we see the part of the Creatures offices where everyone works. Brushing past a large cluster of packed cubicles where employees enjoy their lunch hour, we’re quickly taken to the main attraction: A closed-off room meant specifically for Arita and the other artists who work on Pokémon cards to draw in peace. 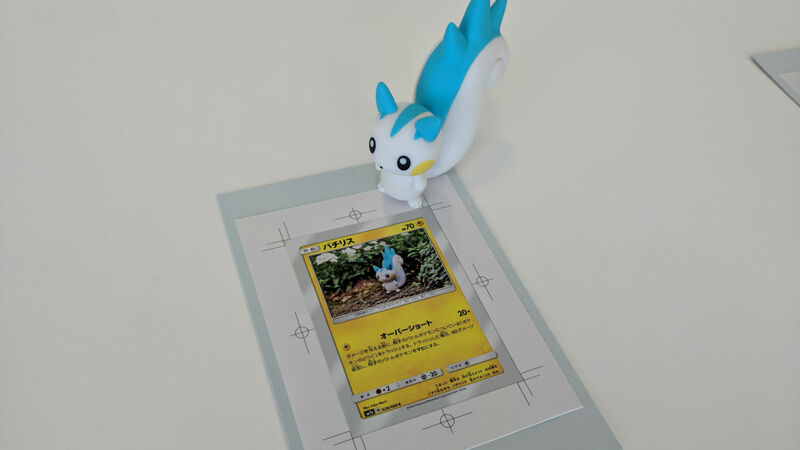 Though Arita does much of his work at his home office, he comes to work in this space on more confidential projects, such as art for cards based on Pokémon which have yet to release. Arita estimates that, from beginning to end, the process of creating art of an individual card can take about seven weeks, though the actual amount of time he spends putting pen to paper varies between cards. 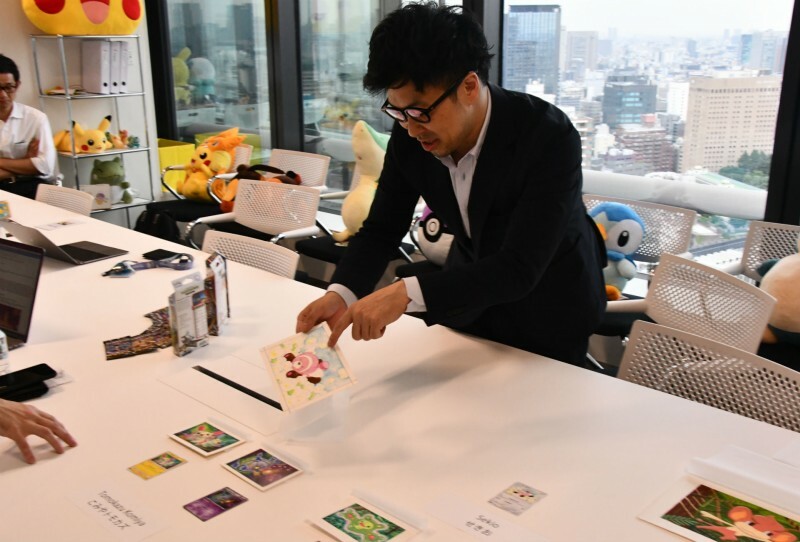 First, Arita receives the order to make the card from Creatures telling him which Pokémon he’s drawing, as well as details about that critter, specific poses, and any themes the company may want conveyed. When it comes to some of the shinier cards (and the more dense full-card art pieces), Creatures also makes decisions about specific holographic patterns as well, though artists do make requests to have certain parts of a card shine according to their own vision. Choosing an art style for each set can be a lengthy process. Art director Satoru Nagaya first chooses an overall art style based on the Pokémon which are prominently featured in the set. When testing a new art style, the team will return to a few specific Pokémon with recognizable silhouettes, most of which tend to be the iconic “starter” Pokémon most players and fans will recognize. These Pokémon are also used when testing new artists on whether their style will fit the company’s needs, determining their ability to create accurate portrayals of Pokémon and delivering the art on time. Once Nagaya has an overall sense of which style he wants, he’ll work with the company’s pool of 73 freelancers to find which artists might best fit that direction. Some artists will occasionally choose which Pokémon and styles they’d like to work witth, but ultimately, it’s up to the art team to dictate which cards are drawn by which artist. Artist Mitsuhiro Arita is responsible for some of the most classic Pokémon trading card art in the world. Arita begins his first draft using pencil on common A4-size paper, though some art styles require working with digital tools right away. He pulls up an in-progress draft of a card featuring Lurantis coyly posing in a tropical clearing. The theme for this set is the Alola region, which means that, along with making Lurantis look detailed and colorful, giving each card a sense of place is important. As such, while Arita is a fan of the simpler backgrounds of the past, this one is fairly dense, with several “local” objects like coconuts and hibiscus flowers using a sharp blue sky. The template Arita uses to draw also has a frame with the dimensions for typical Pokémon card art, letting him see what parts of the art he’s working will fit into it. Arita then shows us several in-progress stages of the same drawing, starting with simple colors outlining the overall tones of the card, then complexifying with more layers over time. If, as in this set, the focus is a location, then it could take some additional time to layer on all the complex background details. Other times, such as when he drew a promotional variant of the card Giovanni’s Scheme, Arita will turn to other forms of art for inspiration (for Giovanni’s Scheme, he used classical portrait paintings as a reference). When the art of the set emphasizes a realistic look, some artists will even go as far as creating plastic figures of Pokémon to photograph for certain cards. Once the artist completes a draft, The Pokémon Company takes its own look at the card. “They sometimes find things that need to get fixed,” Nagashima says. “Sometimes they’ll come back with comments like, ‘No, this Pokémon doesn’t have this shape,’ and we’ll fix that type of thing.” If the team has a specific setting in mind (such as Alola), Creatures will be a little more hands-on about how it wants a card to look. The process goes back and forth between the artist, Creatures, and The Pokémon Company until it’s complete and ready for printing. Testers hold whatever information they collect over the course of the day in their heads, then submit play reports. Near the back of the Creatures office is a room lined with glass walls. As we’re led inside this room for the last stop on our tour, I notice the back wall is lined by a dozen or so cabinets, which we’re told contain just about every card that has ever been released for the Pokémon TCG. The people who normally occupy this room need them to do their jobs. The most important requirement to becoming a part of the group of 19 testers who spend most of their week here is simple: Be a fan of Pokémon and card games. You don’t have to be a top-level player to get in the door; in fact, depending on Creatures’ needs at the time, not being a competitive player may even help your chances, since the testing and design teams place a large emphasis on making the game as accessible as it is competitive. While specific feedback on individual cards varies, the design team is looking for assessments on a card’s power level relative to their expectations. Each card is designed with a specific purpose and power level in mind; if a card isn’t meeting these expectations during testing, the designers examine the card and rework it. 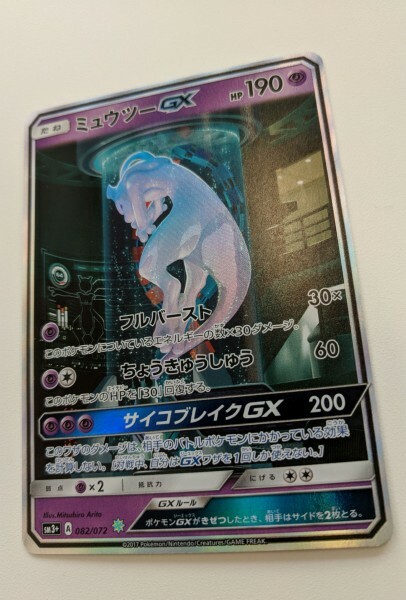 According to head tester Satoru Inoue, small tweaks are fairly common throughout the testing process, but most of the major changes only happen for the “main” cards in the set, or the more powerful EX/GX cards. While the art does most of the talking, Nagashima isn't opposed to exploring other ways of conveying the story in the future. As cards are tested they’re subject to numerous alterations, which means testers have to use “proxy” versions of cards. These are essentially older cards with a sticker on them, displaying the name, stats, and logic of each card as it changes. Each card also displays a picture of the Pokémon it’s tied to, which is more than an aesthetic touch. Designers aren’t just looking for feedback on whether a card works the way it should, but whether the logic matches the Pokémon it represents. Depending on tester feedback, designers will make changes to a card that’s fine functionally to make sure it’s in line with what players expect from a specific Pokémon. From beginning to end, the team playtests situations where one player is much stronger than the other. Part of making the game accessible is ensuring the strongest cards can in fact help newer players defeat veterans, under the right circumstances. This means making sure a card’s power is easy to understand and utilize, and that it behaves consistently across matchups between players of all skill levels. As a set becomes closer to being final (and proxies give way to final iterations with finished artwork), matches between the best testers tend to become more competitive and intense. After all, it’s better to win than lose no matter your skill level, right? Even after months of testing, iterating, and prep between both designers and testers, Nagashima admits his team is often surprised by some of the plays they see once the set is out in the wild. While the team builds sets with particular strategies and decks in mind, cards and combinations often come out of left field, as well as decks they weren’t expecting to be viable being extremely powerful. While the team pays close attention to the meta of the TCG and addresses major issues, they tend to focus on moving forward when making new sets, rather than try to “fix” older strategies. However, with real-world value being attached to every card, the team likes to take underplayed cards and make sure players get more value out of them using newer sets. “That makes a lot of the people who have those cards really happy,” Nagashima says. Because Nagashima and his design team are working a year in advance on new cards, it can be hard to anticipate synergies that players might uncover that need to be fixed in upcoming sets. But that’s something that comes with the territory; if the team were able to predict everything players were capable of, the Pokémon TCG wouldn’t be as fun. While creating sets is a large and arduous process, it’s been worth the effort for over 20 years now, helping grow one of the most popular brand names in the world. The development involves dozens of people helping to design, draw, and test cards that, hopefully, will hold a special place in players’ hearts. And with any luck, it’ll keep working for at least 20 more.